I'm not a vegan, I'm not even a vegetarian but I think all restaurants, cafes, clubs, bars, and anywhere that serves food should ensure there are vegan options on the menu. I don't think that because it's not nice to eat animals (it may not be, but I still love steak and bacon), I don't think it because it's good for the planet (debatable if you look at what plants can grow where and why sheep may sometimes be the best protein creators..but also farts...) I think it because it's good business sense. Many people are vegan these days, whether as a hipster lifestyle choice, a deep rooted love for living things or just not really liking meat, the reasons don't matter to a business, what matters is getting customers through the door. Some cafes seem to think that one veggie option is enough. "Oh we have jacket potatoes with beans if you like, we can leave out the butter if you are vegan". 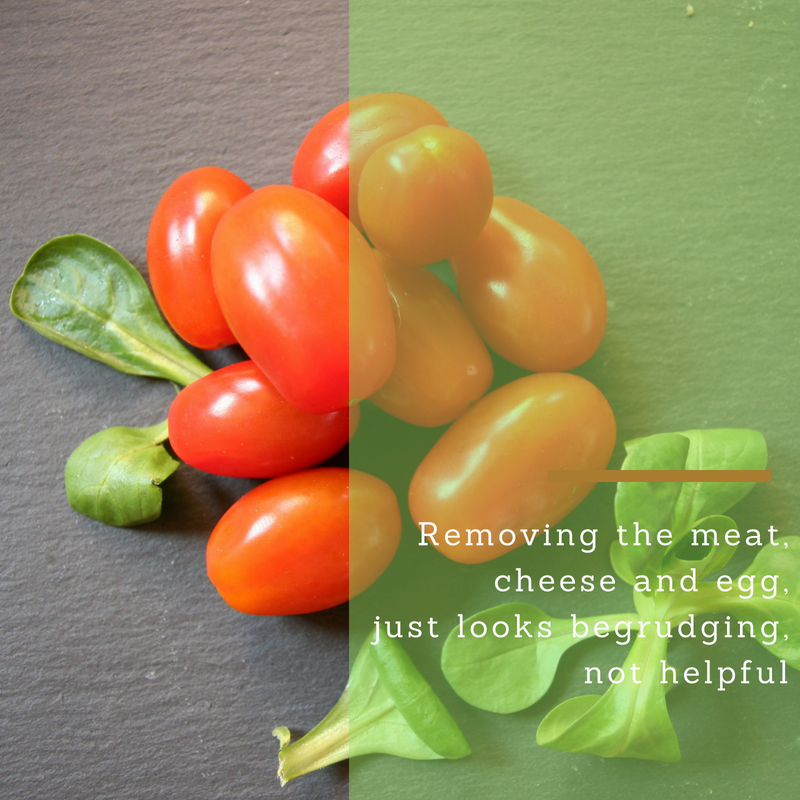 The idea of 'leaving out' the meat or dairy or egg bits seems a common theme. "hmm vegan? well I think the veggie burger might be vegan, I'll leave out the brioche bun and the cheese" Well let me tell you straight, leaving things out is not a menu option, it's lazy and it looks lazy. It also looks mean, "we'll make you a special meal by leaving stuff out and not replacing it with anything" doesn't look like you are happy to help, it looks like a begrudging afterthought. Some eateries think it doesn't matter, after all less than 1% of the UK population is vegan and only 2% of the population is vegetarian. But if you miss those choices from your menu you don't only exclude the vegans, you exclude groups of friends where one of the group is vegan. "Shall we have Jake's party at *Umbertelli's? oh no, they have no real vegan options and Jessica won't want to come, let's go to *Palmita's instead" And the number of vegans is increasing, and they tend to be younger, more likely to eat out with friends. It's not only vegans that benefit either, with increasing awareness of allergies a person with a dairy or egg allergy is going to opt for places with good vegan options too. Religious food restrictions can also affect people, in a multicultural society many religious people struggle to find a place to eat out that caters for them, but vegan is halal and kosher, problem solved. When I'm looking for a location for a works party or a meal out with friends I might include vegans, Muslims, vegetarians and Jews...and some allergy sufferers, it's not being 'precious' to want to be catered for at a restaurant and it's not a lot to ask for the menu to be clear about it either. 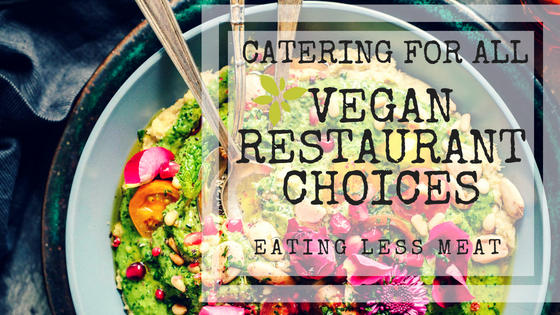 Vegan options are not difficult! Add a vegan section to your menu (and mark them as such, use a different symbol for Vegan than for Vegetarian). Examples of vegan meals include falafel wraps with salad, salads with tofu, stir fries with noodles (egg free) , vegetable soups, hummus salad sandwiches with either no spread or a dairy free spread, olives, fancy breads made with oil, pasta dishes (vegan pesto, tomato sauces etc), risottos with either no cheese or vegan cheese, vegetable burgers, stuffed peppers, garlic mushrooms (use oil or dairy-free spread), Jus-Rol puff pastry is dairy and egg free! so you can even make some puff pastry treats with fruit or roasted vegetables. Pieminister have a vegan pie option. Vegan pizzas, lentil curries. Don't forget to add some vegan desserts too, lots of sorbets are lovely and there are plenty of vegan ice 'cream' varieties to choose from, and exotic fruits in syrup can be a lovely end to a meal. Anyone can eat vegan, so including some vegan options on a menu doesn't restrict the menu, it expands it. Now I have a vegan daughter I can really see what a pain it is to eat out when 99% of the menu is off limits, so come on caterers, make it easier, step up and add some vegan goodies to your menus. Are you vegan? Where is good to eat out and which vegan things do you like to see on a menu? I recently ate at Zizzis and they have a brilliant menu, clearly set out with vegan options. Are there other good examples out there? The best Vegan and Vegetarian Sunday lunches in London.